Will this all-in-one make waves? A versatile channel strip that sounds gorgeous and is a delight to use. Mid-side mode available to each module individually. Waves’ clearly successful partnership with Grammy-winning producer/engineer Andrew Scheps (Adele, Red Hot Chili Peppers, Jay Z et al) continues with the release of this all- encompassing channel strip plugin. The design brief was to create a comprehensive modular suite of processors to deliver the “classic definition of a channel strip” along with the flexibility of a “mixing and matching” approach. Scheps Omni Channel (VST/AU/AAX) is hardly the first plugin to do either - or both - of these things, of course, but production legend Tony Visconti already rates it as his favourite channel strip, and we really liked Waves Scheps 73 so expectations are high. Scheps Omni Channel’s five main modules comprise Pre, EQ, Compressor, Gate and DS2, all of which are freely reorderable by dragging. There’s also an insert slot into which any one of your other installed Waves plugins can be instantiated; and at the very end of the chain is the Master section, where I/O levels are adjusted, monitoring is controlled and brickwall limiting is applied. When first launched, all five modules are visible, but clicking the button at the top right of any one of them pulls it out into the Expanded View. This not only makes certain knobs bigger and thus easier to manipulate, but also reveals more controls - sidechain parameters, for example - and gives access to separate strips for the Left and Right or Mid and Sides channels, depending on the stereo mode currently selected for the module. A clever feature that we hope Waves will roll out to future plugins, Focus Mode highlights those controls that the designer of the current preset (the illustrious list of which, incidentally, includes Scheps and Visconti) has deemed the most pertinent for adjustment based on the intended source material and usage. The highlighting is a tasteful orange glow, and Focus Mode is genuinely helpful and educational. 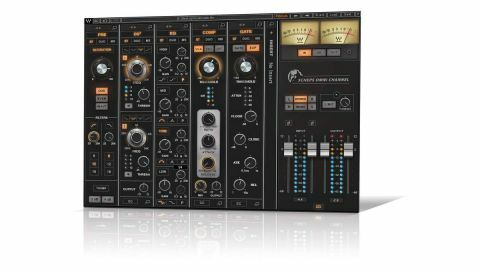 Every one of Omni Channel’s five processors is a thing of beauty, but our favourite is the EQ, which we’ve found ourselves using on its own (within the main GUI - sadly, you don’t also get the modules as separate plugins) on almost everything we’ve done since writing this review. You get four frequency bands to work with, every one sweepable all the way from 16Hz to 21kHz, rather than each covering its own range, and yielding up to 18dB of cut or boost. All four can be used as parametric bell filters, but each band also offers two alternative modes. The top and bottom bands double as shelving filters, with ‘standard’ and Resonant variants, the latter applying resonant bumps to the front and back of the shelf. The central Mid and Tone bands, meanwhile, include Wide and Narrow bell shapes. Narrow is a fairly sharp peak, and Wide differs in width between the two, being tighter and more focal in the Tone band. On to those modules themselves, then, and it should come as no surprise, given the parties involved, that they all sound delicious, individually and collectively. The Pre module features two harmonic distortion modes (Odd and Even) and a modified clipper (Heavy) algorithm, filtering, and 2dB or 4dB of optional low-frequency boost. Gate flips between gating and expansion, and enables adjustment of (internal or external) sidechain filters and hysteresis. Compressor is also fully sidechain-tweakable and made super versatile with its VCA, FET and Opto modes. DS2 is like a two- band de-esser, fed by an internal or external sidechain, but with each band able to target any frequency range from 20Hz to 20kHz for adjustable gain reduction with one of four filter shapes - just the thing for targeted dynamics control of any source signal. Lastly, EQ is discussed in All things being EQ, below. With its flexible routing and stereo functionality (there’s no restriction in terms of per-module L/R or M/S - Gate the mids, EQ the sides, then Compress the decoded end result, for example), stellar sound, admirable ease of use and handy Focus Mode, Scheps Omni Channel is another winner for team Waves-Scheps.